The moment I laid my hands on this book, I thought it was such a brilliant idea to have a book like this. 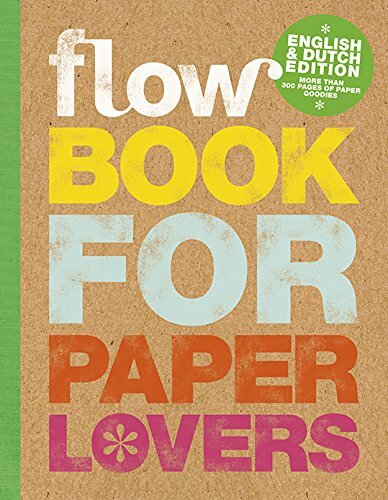 The Flow Book is actually a 300+ page book filled with paper goodies that you can either tear off, cut out or take out. It's a book that paper crafters will love. This book, if I'm not wrong, is a spin-off project from Flow Magazine. And this is the 4th volume, even though it is not mentioned in the book that this is the 4th. The book's split into 3 parts, namely Print Studio, Paper Studio and Pattern Studio. In Paper Studio, there are different types of paper, e.g. wrapping paper, coloured paper, mini posters, mini booklets, gridded paper and many more. In Pattern Studio, there are pages with printed patterns, textures and more stickers. Basically, every page is going to be a surprise. I've never seen such a book before and once you laid your hands on it, I'm sure you'll have lots of ideas and possibilities running through you mind. It must have been so difficult and tedious to physically produce this book because there are so many different parts, e.g. mini booklets, stickers, perforated cut outs, etc. Because of that, I'm actually quite surprised at the relatively affordable price of €19.95 that it's selling at on Flow Magazine website. My copy is from Basheer Graphic Books. This is such a fun and creative book. Go forth and create!